Happy Friday Lovelies! I am happy to announce that once again I have teamed up with a few awesome bloggers to bring you another exciting CAL (crochet along) beginning April 6th! For this CAL we will be focusing on hexagons. 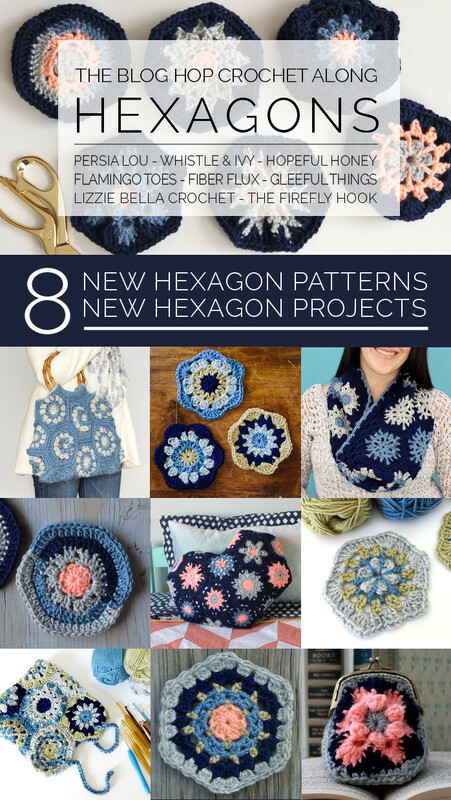 Each one of us has designed a hexagon motif and then we have each made a fun project made with them...neat right?!? In the photos above, you can see a little sneak peek of the motifs and projects. A very special thank you to Knit Picks for supplying us with the gorgeous yarn for the project. We used Knit Picks Brava Worsted if you'd like to check it out (any worsted yarn will work though) I hope you'll join us, and stay tuned! I love the colors you have used. Can you please tell me their names so I can purchase them. Thank you. Will you be doing a video on the raised hexagon pattern? Ive never done one and the videos are so helpful. Thank you.